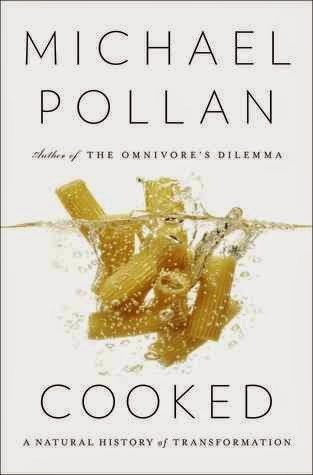 Michael Pollan's The Omnivore's Dilemma was a revelation to me when I first read it eight or so years ago. His deliberately mindful approach to an activity many of us take for granted - eating - opened my eyes to how much I had to learn. Then, when my youngest was diagnosed with dairy and soy allergies a couple of years later and we had to completely overhaul the way we fed our family, I drew on several of the principles in both Omnivore's Dilemma and In Defense of Food. Cooked is a natural progression from those two books, from knowing where our food comes from and the process it undergoes from beginning to end, to actually producing it and preparing it ourselves, participating in that process. Pollan divides the book into four sections, each representing a different category of cooking: Fire, Water, Air, and Earth. For "Fire", he delves into the dark world of barbecuing - real, slow Southern barbecuing. The kind that takes all day and sparks civil wars over the proper techniques and mustard vs. vinegar-based sauces. "Water" investigates the processes of boiling and braising. "Air" chronicles his attempts to discover the perfect recipe and method for baking bread. And in "Earth" he learns the mysteries of fermentation, and its involvement in making everything from sauerkraut to cheese to beer. Cooking is "a defining human activity", one of those things that sets us apart from other animals, Pollan asserts. It's a communal activity, one that is practically vital to a shared meal, which is "a foundation of family life, the place where our children learn the art of conversation and acquire the habits of civilization: sharing, listening, taking turns, navigating differences, arguing without offending." (Don't know about you, but that doesn't describe my dinner table every night, though we're making efforts to civilize our three boys.) Throughout the book, Pollan describes cooking in terms of relationships: with other people, with the food, with previous and future generations, and with other cultures. "Cooking is one of the more beautiful forms that human generosity takes...but the very best cooking, I discovered, is also a form of intimacy." Now of course, specialization in today's world is a necessity. We don't all have time to make everything from scratch, but a bit more awareness, a few more skills, a little more self-sufficiency certainly isn't a bad goal. If nothing else, once you better understand what goes into making a truly high-quality sourdough bread or cheese or braised duck, you can more fully appreciate it. Along with fascinating historical insights, religious connections, and scientific knowledge, Pollan provides an account of what he learned from each of the experts who agreed to teach him. The "tricks of the trade" more often than not turn out to be the three "p"s: "patience, presence, and practice". "Unfortunately," says Pollan," not one of the "p"s came easily to me." Me neither, Michael, me neither! But I will say that I'm more inspired to return to my earlier attempts at artisan bread and cheese-making, and I'm encouraged to continue and expand my canning abilities and perhaps be a little more adventurous with cooking from scratch. There is a deeper kind of learning that can only be had by doing the work yourself, acquainting all your senses with the ins and outs and how-tos and wherefores of an intricate making. What you end up with is a first-person, physical kind of knowledge that is the precise opposite of abstract or academic...At a time when four of our five senses and the whole right side of our brains must be feeling sorely underemployed, these kinds of projects offer the best kind of respite. They're antidotes to our abstraction. And how delicious an antidote!